Future of Sourcing Digital is thrilled to launch a new series titled “Women Global in Sourcing.” This series strives to highlight, celebrate and acknowledge women who are pioneers and leaders in the industry and who have been influential in moving the industry forward. 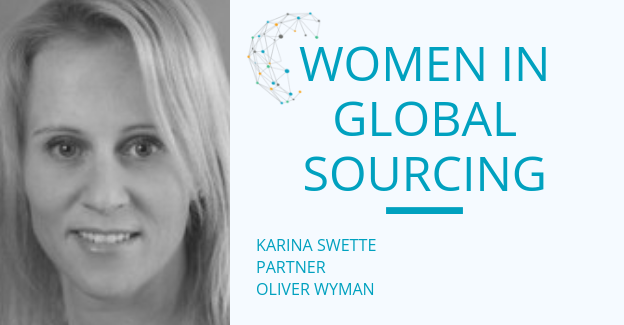 Future of Sourcing welcomes Karina Swette to the series. Karina is a Partner in Oliver Wyman’s Operations Practice. With 14 years of consulting and investment banking experience, she specializes is in value sourcing, supply chain, operational improvements, capital deployment, due diligence and post-merger integration. I started management consulting at Oliver Wyman after graduation. With both marketing and finance internships, it was the best fit for my skill set and opportunity to make the biggest impact. I quickly gravitated toward our operations and procurement teams where I found the utilization of complex (and incomplete!) data to solve business-critical issues fascinating and rewarding. My first big project was helping a major airline renegotiate all its maintenance contracts as part of a bankruptcy exit and I was hooked. Absolutely. Working within procurement in professional services has allowed me to learn and apply best practices from a wide range of industries, companies and categories from all over the globe. The biggest impact on my career has been sponsorship -- having the right sponsors, getting them early in my career and having several of them. It was critical not just for guidance and pushing me but also for helping me get great opportunities and singing my praises (something I am not as good about). It was harder to find great female sponsors as all my managers have been men and people tend to sponsor those that remind them of themselves. But with a little extra effort to connect and ask for help, I am always surprised by how supportive everyone is. The most effective leaders I have worked with have genuine passion for their area of expertise. They are invested in the success of their teams. They lead by example, especially around values. They have positive demeanors and inspire those around them to be their best – and then they give appropriate credit and reward when they succeed. The biggest mistake I have seen is when people approach a negotiation as a battle. I hate the phrase “beat up suppliers.” By the time I am pulled in, often the easy stuff is already done and I am pushing the envelope in creativity. I am building strategic partnerships with new approaches that should benefit all parties. Don’t get me wrong, I am tough as nails, but you catch more flies with honey (aka, strong analytics, a robust process and strategic thinking). Results-driven – I am very high energy, organized and focused on getting it done. Competitive – if it is not a game, I find a way to make it one and always aim to win. I was an athlete when I was younger, and have applied many parallels to my career. Aim for first place, working as a team, and always sprint to the finish line. Generous – I am very focused on the development of my teams. It is important that everyone participates, shows off their skills and learns something new. I care about their professional and personal happiness. I also give a lot of energy to charity, utilizing my business skills to help further the efforts of non-profits. I plan to do my best to find out. I had my two biggest promotions this year – to a Partner at Oliver Wyman and to Mommy. My darling eight-month-old has changed my whole world (for the better!). It is certainly a balancing act but it is all worth it. I am making it with work by 1) having the perfect partner who is proud of all that I do and shares in the responsibilities at home; 2) working somewhere I love with people who are supportive and understanding; and 3) saying no sometimes. Find a great mentor (someone that gives you good advice) but also make sure you have a great sponsor (someone who advocates for you and helps find you opportunities). It can be hard to ask for help but frankly you need to do it to maximize your career potential. Assuming if you work hard that good opportunities will just come your way (which I did for many years!) is misleading. Don’t forget to sing your praises—and use your sponsors to help you. I find that women are more likely to credit the team and don’t often speak of their own successes.